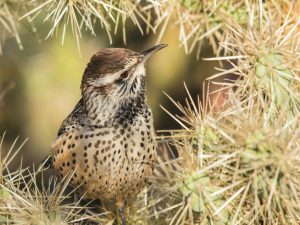 Last year’s calendar cover photo, a cactus wren surrounded by cholla cactus, was taken by Pamela Parker of Mesa. PHOENIX- Do you have a knack for capturing great photos of Arizona’s wildlife? Do you want to see your photo on the cover of Arizona Wildlife Views, Arizona’s award-winning magazine about wildlife and outdoor recreation? Then you won’t want to miss the Arizona Game and Fish Department’s 12th annual Arizona Wildlife Photo Contest. One best in show and 11 first-place winners will be showcased in the 2019 calendar, published in the November-December 2018 issue of Arizona Wildlife Views. The best in show first place winners are featured in the issue and, new this year, the cover photo will also be spotlighted inside the issue on one of the calendar months!